"Cardassians" redirects here. For the second-season episode of DSN, see Cardassians (Star Trek: Deep Space Nine). Not to be confused with Kardashian. The Cardassians (/kɑːrˈdæsiənz/) are an extraterrestrial species in the Star Trek science fiction franchise. Introduced in the 1991 Star Trek: The Next Generation episode "The Wounded", the species originated on the fictional Alpha Quadrant planet Cardassia Prime. Cardassians were the dominant species in an interstellar empire known as the Cardassian Union during the 24th century, although they are not confirmed to have ruled any other species aside from, for fifty years, the Bajorans. The Cardassians later played a key role in the story line of the Star Trek: Deep Space Nine series as allies of the Dominion in the Dominion War. Several Cardassian characters, including Elim Garak and Gul Dukat, are prominently featured. The Cardassians were developed by the writers of the Star Trek TV series The Next Generation to provide an enemy race with whom the protagonists could interact, unlike the Borg, with whom such interpersonal drama was difficult due to their lack of personality and individuality. Cardassians, even when not directly present in Star Trek, are a foundational concept for Deep Space Nine and Voyager, because of their occupation of Bajor–Deep Space Nine takes place on a formerly Cardassian space station; because the Maquis resulted from the border re-shuffling in the Federation-Cardassia peace treaty; and because this is the background of many of the major characters on Star Trek: Voyager. Gul Dukat (portrayed by Marc Alaimo), a prominent Cardassian character in Star Trek: Deep Space Nine. Cardassians are a humanoid race, with light grey skin. Their faces have small ridges on their sides, which converge to a characteristic crest shape on their foreheads, with female Cardassians sporting a blue or blue-green coloration to their crest. This crest has led to the derogatory nickname "spoonheads" used by other races. Males are generally taller than the average and both genders have narrower hips and wider shoulders. Cardassians typically have long, jet-black hair, slicked back by males, and either grey-blue or black colored eyes. Very little is known of their internal physiology, but it is generally assumed that they possess lungs, a heart, stomach, intestines, and other internal organs common to almost all humanoid species. Cardassians are known to be punctual to a fault, so much so that in the episode The Way of the Warrior, Gul Dukat remarked that Captain Sisko's arrival to aid his escape from Klingon ships "I must commend you Captain, you're almost Cardassian in your punctuality." Among Cardassians, showing romantic interest in someone is usually done by bickering with them. This sometimes leads to misunderstandings with non-Cardassians, as Cardassians are not known for their pleasant personalities to begin with, so non-Cardassians are often caught off guard when a Cardassian suddenly becomes romantic with them after spending days bickering. Cardassian burial rites are only briefly mentioned, but it is known that it is considered offensive for a non-Cardassian to view a Cardassian's remains at any stage during funerary rites. Gender discrimination of any kind is unheard of among Cardassians. Males and females alike are seen at all levels of the government, military, science, and other positions, and interactions between them are shown to be as equals. Several members of the Detapa Council depicted on-screen are female, as well as several Guls and members of the Obsidian Order, and males of subordinate rank have no issue taking orders from them. By tradition, the commanding officer of a Cardassian vessel or station is expected to entertain notable guests or dignitaries on board, and if they are hauling cargo of any value, they are expected to be compensated with a percentage of the proceeds. Some Guls earn a significant amount of money doing so, which garners them influence. Cardassians in general tend to take a very dim view on extramarital affairs, not for its moral implications per se, but because this information could be potentially used to devastating effect in the future to destroy a Cardassian's career or livelihood. Cardassian officers whose affairs were publicly exposed could be disowned by their families, have their spouses divorce them, etc. Officers who were caught in such an affair were often severely admonished, often being reassigned to posts they find extremely unpleasant, such as guard duty at the Cardassian Embassy on Breen (reputed to be a frozen wasteland), or even downright offensive. 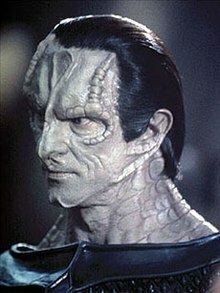 Most Cardassians have, by the standards of other races, abrasive personalities, and have a well-deserved reputation for blusterous talk, often going on long-winded speeches, even in response to simple inquiries. Therefore it is a pleasant surprise when on rare occasions, someone meets an amiable Cardassian. In fact, they are almost viewed with a measure of suspicion, which may be justified in some cases, since it could just be a ruse to gain someone's trust, especially if the Cardassian has any ties to the Obsidian Order, since even other Cardassians tend to keep those they know are members of the Obsidian Order at arms' length. Cardassian jurisprudence is well known among the other races in the Quadrant. Suspects are presumed guilty and almost never proven innocent, with verdicts and sentences always determined well in advance of the trial. The Cardassians do have Articles of Jurisprudence, which state, among other things, that while the suspect has the right to refuse to answer any question, refusal to answer would be interpreted as a sign of their guilt. The list of charges are never told to the suspect in advance of the trial, and they only find them out as the trial progresses. The trial itself is presided over by a Chief Archon, and is simply for show, merely used to display the futility of committing crimes against the state. Sentences range from hard labor to the death penalty, and the suspect's conservator (the Cardassian equivalent of a defense attorney) is only there to get them to understand their own guilt and accept it. In fact, it can ruin the career of a conservator if they were to actually win a case and get their client off, though this is almost unheard of. Trials are always publicly televised so the population can see the defendant's guilt for themselves and how futile it is to go against the state. Suspects have no legal recourse to appeal a verdict once it is made. High ranking officials that have some sway within the government have occasionally intervened in some cases, getting the courts to levy a sentence other than death for instance, but this often requires some significant favors in return. Suspects are also permitted a nestor, a sort of secondary legal advisor that has no real equivalent among the legal systems of other Alpha Quadrant species. The Obsidian Order is a Cardassian intelligence organization. Security Chief Odo of Deep Space Nine remarked that it was one of the most brutally efficient organizations in the galaxy, being even more ruthless than the Romulan Tal Shiar. The Order kept close tabs on all Cardassian citizens to ensure loyalty, and was greatly feared. It was said that the average Cardassian could not sit down to dinner without the contents and ingredients of the meal being noted and logged by the Order. Odo also noted that the Order caused people to disappear for even less than eating something of which the Order did not approve, although this statement may have just been an exaggeration for effect. The Obsidian Order's agent training program is so advanced that they are made immune to most forms of interrogation, including Vulcan mind melds, and possess eidetic memories. The Obsidian Order is just as obsessive about retaining all its meticulous records, as well as keeping everything and anything that comes into its possession, never knowing when it may prove useful. In the episode "Second Skin", Entek, an operative supervisor, had a corpse bearing the exact likeness of Major Kira beamed in to show her, trying to convince her that she was one of his deep cover operatives. He mentions they have many other such "Exhibits" in their vaults, including archaeological artifacts, data transcripts, cryogenically stored biological samples, and the list goes on. The Obsidian Order frequently clashed with the Central Command (the Cardassian military), partly because even the highest-ranking Command officers are not immune from Order inquiries. Conversely, high level Order operatives and other senior Order officials are frequently reminded that the Obsidian Order's autonomy is a privilege that can be revoked at any time by the Central Command, should the Order do something that displeases them, something which would effectively cripple the Order. Theoretically, both the Central Command and Obsidian Order answer to the authority of the Detapa Council, the highest ruling body on Cardassia, but in practice, each is free to run its own affairs independently of the other with only negligible interference from the Council. Elim Garak was a member of the Order, before being exiled from Cardassia to Deep Space Nine by his father, Enabran Tain. Tain had retired for a time, the only director to ever live long enough to do so. Garak became an ally of the Federation who used his knowledge to aid them in the war against the Dominion. In 2371, under the leadership of Tain who believed that the Central Command was being too complacent about the threat of the Dominion, the Obsidian Order and their Romulan equivalent, the Tal Shiar, allied in an attempt to destroy the Dominion. To this end, the Order began stockpiling a fleet of ships, albeit illegally without the Central Command's knowledge or approval; the Order's own charter expressly forbids them from developing or possessing military equipment of any kind, which includes warships and possibly starships in general ("Defiant"). (Their lack of starships was noted when, in one DS9 episode, a high-ranking official from the Order had to "hitch a ride" on a Cardassian warship for transportation.) The plan, originated by Tain, involved a fleet of 20 cloaked Romulan and Cardassian vessels traversing into the heart of Dominion territory in the Gamma Quadrant where they would annihilate the homeworld of the Founders. The Founders soon learned of the plan, via a Changeling who impersonated Colonel Lovok of the Tal Shiar, and saw it as an opportunity to eliminate the two dangerous organizations. When the Romulan/Cardassian fleet arrived at the Founders' homeworld, they bombarded it, only to realize that the planet was deserted except for a beacon creating false life signs. Moments later, the Dominion sprang the trap they arranged and a fleet of 150 Jem'Hadar fighters emerged from hiding in a nearby nebula and proceeded to wipe out the fleet. At least a few Romulan and Cardassian officers survived to be taken prisoner. Tain himself survived for two years in a Dominion internment camp (“In Purgatory's Shadow”), where he reunited with Garak before dying of heart failure. The disastrous results of this attack crippled the Tal Shiar but more importantly (and perhaps through fear that the Order had clearly become too independent) it led to the downfall of the Order. The elimination of the Order is thought to have contributed to a political shakeup that led to the renewed empowerment of the civilian Detapa Council which proceeded to overthrow Central Command, provoking an invasion of Cardassia by a concerned Klingon Empire (“The Way of the Warrior”). The turmoil eventually led Cardassia to become a member state of the Dominion (“By Inferno's Light”). After Cardassia joined the Dominion, an organization similar to the Obsidian Order was formed, which was called the Cardassian Intelligence Bureau. In the short story "The Calling" within the book Prophecy and Change (ISBN 0-7434-7073-7), the agency is still shown to be active as an ally of the Reunion Project, which Elim Garak is a part of. However, the agency operates at a much lesser efficiency than it once did. Cardassian military ranks are similar to those used by the United Federation of Planets, but with some key differences. For example, a legate is similar to an admiral, but with considerably more political sway. The Cardassian Central Command uses a system of hierarchical ranks, which is the same for all branches of the service. A gorr is the lowest-ranked soldier, the rank where all new recruits start. Garresh, a more senior enlisted rank, make up the vast bulk of the military. They are individually ranked on a five-number scale. The lowest commissioned rank is that of gil (sometimes seen as kel), followed by glinn, dalin, dal and gul. There appears to be no gender discrimination in their military structure, and female Cardassians appear just as capable of promoting up through the ranks as their male counterparts. Officers must generally hold a rank of at least glinn to be given command of a department on board a starship or within a unit. Larger vessels and units require dalin or dal level officers. Guls are the rough equivalent of Starfleet captains. They are the majority of the commanding officers in Central Command, controlling starships and bases, and serving as prefects and planetary governors throughout the client worlds of the Union. Many guls are quite influential, building up extensive vesala networks. Jaguls and Legates are the equivalent of Starfleet admirals, commanding entire Battalions and Orders. Gorr is one of the lowest named ranks in use in the 24th century by the Cardassian Guard agency of the Cardassian Central Command. Equivalent to a 'crewman' in most naval organizations. Garresh make up the vast bulk of the military. Garresh is an enlisted title which is approximately equivalent to a non-commissioned officer, such as a petty officer or chief, of comparable military or naval service organizations, such as Starfleet. Gil (sometimes seen as Kel) is an officer rank which is approximately equivalent to an ensign of Starfleet. Nor-class space stations, such as Deep Space Nine, typically carry enough lifeboats only for personnel down to, and including, the rank of Gil. Glinn is an officer rank which is approximately equivalent to a lieutenant of Starfleet. Glinn is a staff officer rank. Dalin is an officer rank title which is approximately equivalent to a lieutenant commander. Dal is an officer rank title which is approximately equivalent to a commander. Gul is an officer rank title which is approximately equivalent to a ship's captain. Gul is a command officer rank. Guls hold command ranging in size from vessels to Orders (approx. 500,000 personnel). Jagul is a flag officer rank which is approximately equivalent to a commodore or rear admiral. Legate is a 24th-century Cardassian officer rank title which is approximately equivalent to an admiral. Legate is the highest rank in the Cardassian military, and while it resembles the rank of admiral in some respects, it is more of a political position than a rank. Since the Cardassian government is a military-controlled stratocracy, Legates serve both military and governmental functions simultaneously. Known Cardassian starships include the Galor-class warship, a medium-sized cruiser which, throughout The Next Generation, was the most powerful vessel in Cardassian service. Rick Sternbach designed the Galor class to be reminiscent of an ankh, an inspiration chosen because the Cardassians were the pharaohs to the slave Bajorans. The Galor continued to act as the backbone of the Cardassian fleet throughout the events of Star Trek: Deep Space Nine. Ships of this type are armed with a large phaser cannon (possibly a plasma cannon). They are also armed with numerous secondary phaser cannons mounted at other points across the hull, and they may carry a complement of photon torpedoes. Although no clear indication of the true strength of a Galor-class vessel has ever been given, they are shown to be considerably weaker than the Galaxy and Nebula-class ships used by the Federation Starfleet ("The Wounded"). Technical descriptions indicate that Cardassian ships were designed to act in packs rather than as single ships, unlike their Federation counterparts. A more powerful Cardassian ship is the Keldon-class starship (which is similar to the Galor-class with more defined aft wings and a large trapezoidal pod atop the main hull). This ship class is assumed to be comparable to the Galaxy-class in tactical capability; why they have not been seen in greater numbers is uncertain. As seen in later Deep Space Nine episodes, the Galaxy-class vessel was produced far more than its original run, so it does seem odd that the similarly advanced Keldon did not appear as often. The Cardassian Obsidian Order built a fleet of Keldon class starships which were used in conjunction with the Romulan Tal Shiar during the sneak attack in the Omarion Nebula. The Cardassians have also been known to operate small attack craft such as the Hideki-class scout. It is a small attack craft composed of a semi-elliptical fore with a short aft extension ending in a pincer-shaped disruptor weapon. Due to the ship's limited offensive power the Hideki-class is confined to border patrol duties during peacetime. During the Dominion War, the class was present in several major conflicts; they operate in large groups and swarm enemy ships, this allows them to overpower much heavier vessels. All Cardassian warships seen so far are painted ochre, and have backwards-swept delta winged hulls (resembling the Cardassian national symbol); the delta wings resemble fins, giving the Cardassian ships the appearance of predatory rays. Cardassian computers use data encoded on isolinear rods, in contrast to chips used for similar purposes by human-designed computers. The Cardassians' homeworld, Cardassia Prime (also known simply as "Cardassia"), is the second planet of its system (Cardassia II). Even though the planet's orbit is far out from its star—a Cardassian year is over 40 earth years due to the size of the planet's sun—the climate is still warmer than that preferred by several species. Summers tend to be in the 57–68 °C (135–150 °F) range and winters tend to be in the 35–43 °C (95–110 °F) range. Human and Bajoran characters, among others, make comments throughout Star Trek: Deep Space Nine's run about Cardassians' preference for heat, while characters like Elim Garak complain about the uncomfortably cool temperatures preferred by non-Cardassians. Its landscape is often arid, though animal and plant life are still plentiful on the surface. In The Next Generation episode "Chain of Command", David Warner's character states that in Cardassia's early history, its inhabitants were a peaceful and spiritual people. In the days of the First Hebitian Civilization, the Cardassians collected works of art from all over the Alpha Quadrant and the planet boasted a vast wealth of art and culture; the people were said to have elaborate burial vaults with unimaginable treasures. However, Cardassia's lack of natural resources caused terrible famine, and the Hebitian civilization fell into decay. Its ruins were plundered by starving Cardassians who sought to sell whatever they could to provide for themselves. A fascistic totalitarian dictatorship soon came to power, building fleets of warships and invading nearby worlds, although whether or not the Cardassians literally conquered and ruled worlds inhabited by other sentient races is unclear. An exception is Bajor which was occupied for fifty years, and the end of whose occupation destabilized the Cardassian government and formed a key story arc for Deep Space Nine episodes. The date of first contact between the Cardassians and Starfleet is unknown, but is likely to have occurred mid-to-late 22nd Century, as a Cardassian exile, Iloja of Prim, lived on Vulcan during that time period. Sometime before 2347 the Cardassians attempted to expand into Federation territory and war broke out, lasting around twenty years. Captain Edward Jellico spearheaded successful attempts by Starfleet to negotiate a peace treaty which ended the war. Shortly after the Cardassians withdrew from Bajor, a Federation presence was established aboard Terok Nor, renamed Deep Space Nine, to assist the Bajoran Provisional Government in rebuilding Bajor. However, the Federation officers discovered a wormhole to the Gamma Quadrant close to the station ("Emissary"). Roughly four months later, the Federation-Cardassian borders were redefined, with the two sides buffered by a demilitarized zone. However, the new border treaty gave Cardassia control of several worlds inhabited by Federation colonists and the Federation colonies inhabited by Cardassians. Disgruntled former Federation colonists in the area, feeling that their opinions and wishes had been ignored by both sides, formed a resistance movement known as the Maquis. In January 2372 (Stardate 49011) the Klingon Empire attacked the Cardassian Union, believing the Detapa Council of Cardassia (which had just come to power in the wake of the Cardassian Central Command being overthrown, making it the first civilian government of the Cardassian Union with Gul Dukat as military advisor) had been infiltrated by the Dominion ("The Way of the Warrior"). The attack was led by General Martok who, it turned out, had been himself replaced by a Changeling, one of the leaders of the Dominion (first revealed in "Apocalypse Rising"; see also "In Purgatory's Shadow"). Sometime between October 2372 and February 2373, with a Dominion attack on Deep Space Nine imminent, Gul Dukat announced the Cardassian Union's entry into the Dominion, shocking not only the Federation but most Cardassians as well. At the same time, Gul Dukat announced his ascension as leader of the Cardassian Union. Five days later, the Klingons had been expelled from Cardassian space and nearly the entire Maquis movement was slaughtered by the Dominion (except for those on the USS Voyager, which was lost in the Delta Quadrant at the time). Otherwise, nearly all the other Maquis who had not died were in Federation prisons. The Cardassians (as members of the Dominion) captured DS9 ("Call to Arms"), but the Federation managed to block the Bajoran wormhole with self-replicating mines, preventing the Dominion from sending reinforcements from the Gamma Quadrant. Gul Damar discovered a way to disable the self-replication of the mines and completed the procedure and fired on the minefield seconds before Rom and Kira disabled DS9's weapons in hopes to prevent just that. The USS Defiant attacked DS9 and managed to take it back when a physical entity known as the Bajoran Prophets prevented and stopped an entire Dominion fleet, sent to reinforce Dominion lines, on its way through the wormhole. Gul Dukat was captured after his daughter Tora Ziyal was killed by Gul Damar (who found out that Ziyal was helping the Federation), who was then promoted to Legate ("Sacrifice of Angels"). Under the leadership of Damar, the Cardassian Union, along with the Dominion, continued to gain ground over the Klingon-Federation alliance, and even after Benjamin Sisko and Elim Garak tricked the Romulans into breaking their non aggression treaty with the Dominion and joining the alliance ("In the Pale Moonlight") they still managed to keep the upper hand. Damar, however, was not happy. While he had hoped that Cardassia's joining the Dominion would strengthen their power, he felt that they were no longer in control of even their own planet, having to report to the Dominion representative Weyoun and the Founders, and Cardassian troops were being sacrificed seemingly meaninglessly without his permission. For a time, Damar sank into heavy drinking. Shortly after the Breen joined the Dominion, almost guaranteeing the Dominion's victory, Damar organized a revolt but was betrayed by a man he attempted to involve in the conspiracy. Subsequently, a Cardassian named Broca became Legate and puppet ruler of Cardassia with his information, and after treason within the Revolt, the Dominion crushed it and forced Damar into hiding. The revolt started out as just a small legion of troops headed by Damar, but during the final assault on the Dominion over Cardassia Prime by the Federation-Klingon-Romulan alliance, Damar managed to get an open revolt started on Cardassia itself. In response to Cardassian citizens engaging in acts of sabotage, the Dominion punished the Cardassians by destroying Lakarian City killing two million men, women, and children in the process of reducing it to ashes. As a result, the Cardassian fleet switched sides during battle and assisted the alliance, opening a hole in the Dominion lines and forcing the Jem'Hadar and the Breen to establish a new defense perimeter around Cardassia Prime itself. When word of the fleet's defection reached the Dominion command center, the Female Changeling ordered every Cardassian on the planet killed. With the Cardassian fleet helping the alliance and the rebel's attack on the Dominion headquarters on Cardassia, the Dominion surrendered, ending the Dominion War. The Cardassian cost due to the Dominion War was the highest of all the major powers. The homeworld was severely damaged by the Dominion, whose Founders ordered a "scorched earth" approach to the Cardassians' homeworld for their betrayal during the final battle of the war. The long-term effect on the ecology of the planet remains to be seen. Over 800 million Cardassians died on Cardassia alone. Several non-canon sources have placed the pre-war population at around seven billion, and with the canonically established Cardassian emphasis on the family unit, the race is safe from extinction. In the Mirror Universe, the Cardassians formed an alliance with the Klingons and conquered the Terran Empire, enslaving Terrans and Vulcans in the process. A Terran rebellion was formed shortly thereafter. Alliance scientist Jennifer Sisko built a device that would reveal the rebels' base in the Badlands. However, Benjamin Sisko managed to convince her to join the rebels. Later, the rebels captured the Cardassian space station Terok Nor and Alliance leader Intendant Kira Nerys. Miles O'Brien and the rebels built a warship known as the ISS Defiant to combat the Alliance. The rebels managed to destroy a Cardassian-Klingon fleet trying to retake the station while the Intendant escapes. Two Ferengi and a Trill give the Alliance cloaking technology from the Prime Universe in exchange for Grand Nagus Zek. The Alliance enslaves the four on board a Klingon ship (including the Grand Nagus) despite the deal they made and plans to have Elim Garak execute them. However, one of the Ferengi reprogrammed the cloaking device to sabotage the ship's power grid. The rebels capture the ship while the four escape. In cosmology, the concept "Cardassian expansion" is a term used for a modification to the Friedmann equations. It is named after the fictional Star Trek race by the original authors, Katherine Freese and Matthew Lewis. In their 2002 paper (which has been cited more than 330 times), a footnote on the "Cardassian term" states: "2 The name Cardassian refers to a humanoid race in Star Trek whose goal is to take over the universe, i.e., accelerated expansion. This race looks foreign to us and yet is made entirely of matter." ^ "Interview with Rick Sternbach". July 25, 2007. Archived from the original on November 21, 2011. Retrieved 2012-01-16. ^ Freese, K.; Lewis, M. (2002). "Cardassian expansion: A model in which the universe is flat, matter dominated, and accelerating". Physics Letters B. 540: 1. arXiv:astro-ph/0201229. Bibcode:2002PhLB..540....1F. doi:10.1016/S0370-2693(02)02122-6. ^ "Citations for 2002PhLB..540....1F from the ADS Databases". Harvard University.